One of the easier topics in the curriculum - Place Value - can still perplex many students, particularly when talking about the values of the digits after the decimal point. I still have students who struggle with ordering decimals and calculating which is closest to a certain value. I also come across students who struggle with the terminology. Place value is one of those topics than can be addressed through mini activities throughout the year, and it always helps to reinforce the topic - even with high ability students. The discussion is important afterwards - question their strategies. 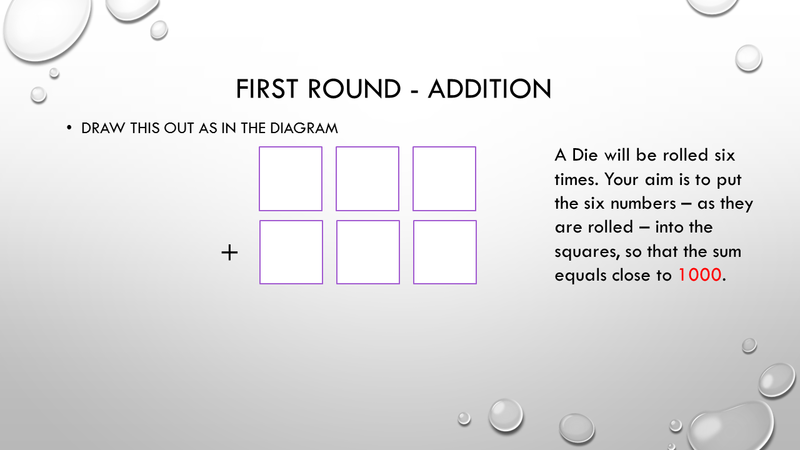 There is also a harder set as well, which involve decimals. Hopefully some discussion about place value will occur. 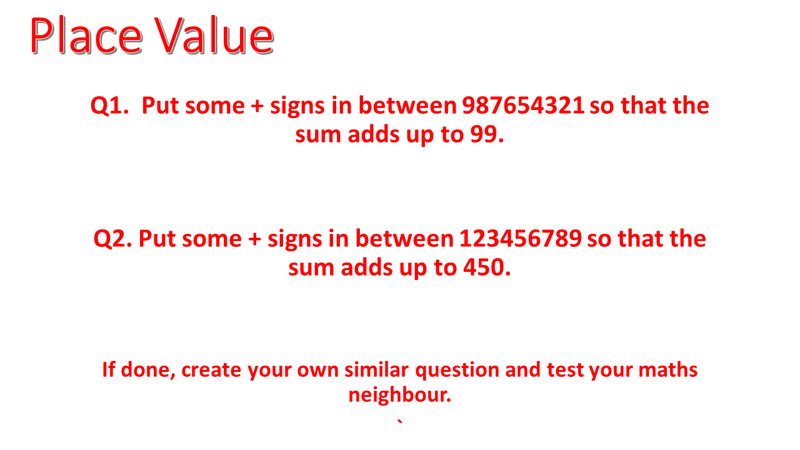 Another useful way to introduce some 'fun' (of course it is all fun) is with the 'Place Value Game' . There are many variations of this, I don't claim this as my own by any stretch. Mine has a full class version (which I usually play last lesson of term) and a two player version. I move onto a Prezi which zooms into a unit to show that it can then broken down into smaller denominations. We talk about notation then - which one is called what, and why. I think it is super important to explain what 1/10 is. It is a wow moment to many that 0.1 actually shows one tenth. 0.6 is six tenths so 6/10. One way to consolidate is to play Place Value Bingo. This is a sneaky resource I made. Its a fairly straightforward Bingo - but great for assessing progress. If you play to Full House - which isn't long at all - then you'll end up with 1 in 7 of your class winning at the same time. If you then play one more slide - everyone will win. So... if there are any students who don't have Bingo - make a note, tell them unlucky, and you know they need some support. 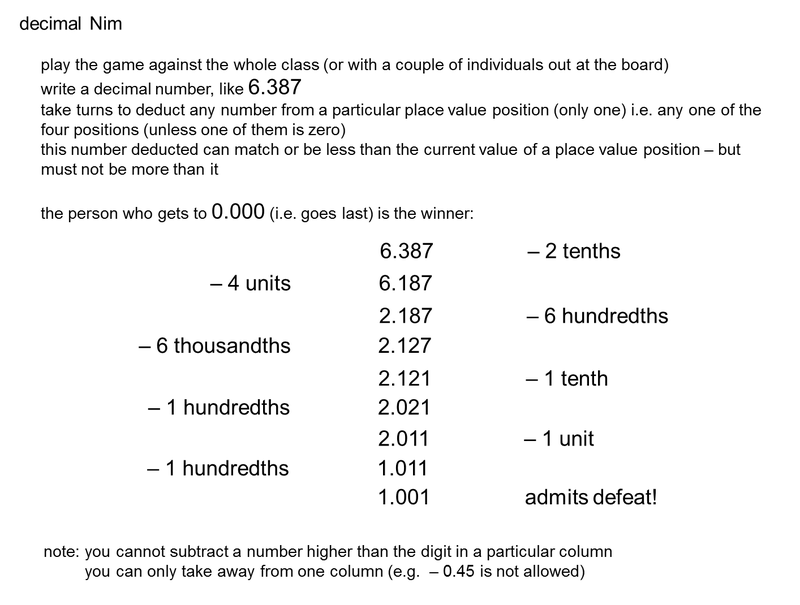 Don Stewards Blog as always, has some good resources with place value and decimals, but the best are found under Decimals labels rather than place value. Finally, two worksheets I use, mainly for lower ability - or an easy early in the year homework. Rearranging decimals given the text, or spotting the missing place value - is actually done quite poorly in a lot of cases. Something different to many other questions.